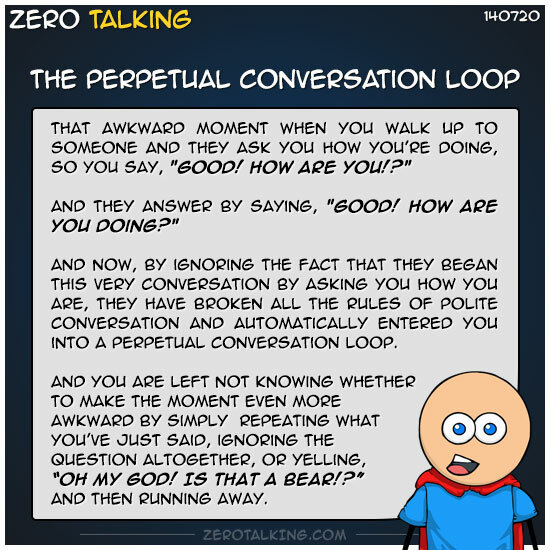 And now, by ignoring the fact that they began this very conversation by asking you how you are, they have broken all the rules of polite conversation and automatically entered you into a perpetual conversation loop. And you are left not knowing whether to make the moment even more awkward by simply repeating what you’ve just said, ignoring the question altogether, or yelling, “Oh my god! Is that a bear! ?” and then running away.